Mohammed died in 632 AD. His second wife’s father, a rich man named Abu Bakr, took over as caliph. He became the leader of the new religion of Islam, and of the newly united Arab tribes. Mohammed left no sons, and in any case there was no tradition of sons taking over in the Arab world. When they heard that Mohammed had died, the Arab tribes wanted to go back to being independent from Abu Bakr. We call that revolt the Ridda. But Abu Bakr got together an army. He destroyed the Ridda and brought those Arab tribes back under Islamic control. Abu Bakr was already pretty old. He only lived for two years after becoming caliph. But he managed to unite the whole Arabian Peninsula under Islam. Almost as soon as he got power, in 634 AD, the second caliph Omar led Arab raids into both the Roman and the Sassanid empires. Both raids were very successful. The Arabs had been doing most of the fighting for the Romans and the Sassanians. They knew that neither the Romans nor the Sassanians had good armies anymore. Omar was assassinated in 644 AD, and succeeded by Uthman. Encouraged by these early victories, Uthman and his army organized a real campaign. By 651 AD they took over most of West Asia, from the Mediterranean coast to eastern Iran. Uthman was also assassinated, in 656, and the fourth caliph was Ali. Ali had a more radical view of the Islamic faith. He wanted everyone to be equal, and cooperate together. Under Ali, the soldiers of the Islamic Empire fought their way through Egypt and North Africa. Even though Ali was assassinated in 661, the armies kept on going. They crossed the Straits of Gibraltar to attack Visigothic Spain in 710 AD. The Umayyads founded Kairouan, the fourth holy city of Islam, in Tunisia, in the late 600s AD. As the Arabs made their way through North Africa, they built small forts or ribats all over the place. They guard against attack, especially along the coast. Many ribats are still there today. 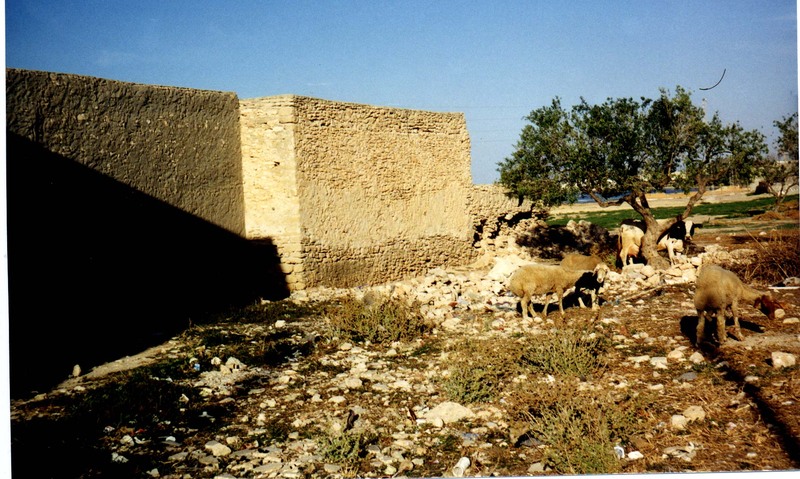 This is a ribat from a village in Tunisia called Lamta (notice the goats grazing near it). After the death of Ali, there was a bitter religious and political struggle between different groups of Muslims. The Sunnis were followers of a more traditional Islamic faith. 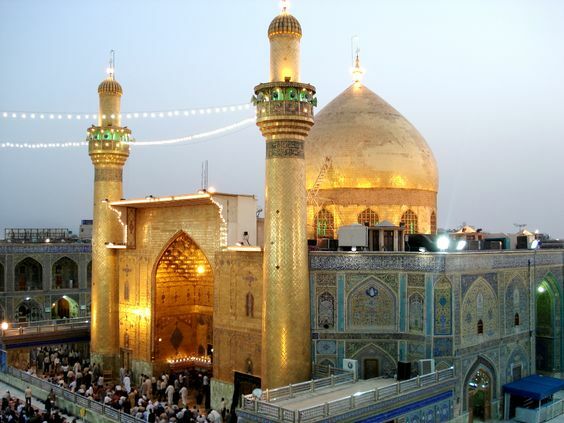 The Shiites (SHE-eye-ts) were the radical followers of Ali. The Sunnis won. 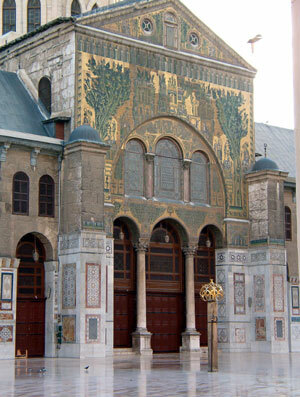 They established the Umayyad dynasty, with its capital at Damascus in Syria. But there were still lots of Shiites, and they were pretty angry about it. 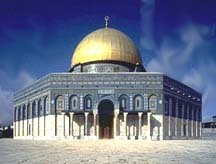 In Jerusalem, the Umayyads built the first major mosque. That was the Dome of the Rock. It was on the site of Solomon’s Temple (and the place where Abraham almost sacrificed Isaac). They began building it in 687 AD and finished it in 691 AD. Eventually the Umayyad armies met people they couldn’t beat. In the West, the Romans stopped Islamic attacks against Constantinople in 674-678 and again in 717 AD. The Frank Charles Martel, grandfather of Charlemagne, turned back a series of Islamic raids into France in 732 AD. But the Umayyad dynasty didn’t last much longer. In 750 AD, the Abbasid family killed off all the remaining Umayyads but one, and took over as the Abbasid Caliphs. The one surviving Umayyad man fled to safety in Spain, where he established the Umayyad dynasty of Spain. Cite this page: Carr, K.E. The Umayyads – Early Islamic History. Quatr.us Study Guides, July 25, 2017. Web. April 25, 2019.